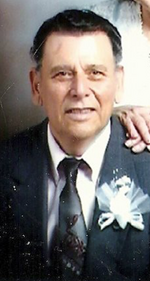 Roberto Valadez Rocha, age 85, died peacefully on Sunday, May 20, 2018. He was born in Palau, Coahauila, Mexico to Francisco and Marie (Valadez) Rocha on March 20, 1933. Roberto was known for being a family man, who enjoyed fishing, cook outs and spending time with his family. He was a loving husband, father, grandfather, great grandfather and friend to many. Roberto is preceded in death by his parents, daughter Deborah Mosley – Hallaway, son Victor Solis, brother Jesus Valadez and sisters Magoda Lena Rocha and Dolores Rocha – Patino. Left to cherish his memory is his wife Rosa Rocha; grandchildren David Garcia, Rox-Ann Ruizzorrilla and Albert Garcia; great Grandchildren Julian Oliver, Skyler Garcia, Lilliana Garcia, Isabella Rose Ruizzorrilla, Aden Ruizzorrilla and Sophia Ruizzorrilla along with numerous extended loving family and friends. An evening service will be held at the Templo De Esperanza Church, 510 East Irving Blvd., on Wednesday, May 23, 2018 between 6:00 and 9:00 pm. A funeral service will be held 10:00 am, Thursday, May 24, 2018 at Brown’s Memorial Funeral Home, 707 N. MacArthur Blvd in Irving with interment at Oak Grove Memorial Gardens, 1413 E. Irving Blvd., immediately following. To send flowers to the family of Roberto Valadez Rocha, please visit our Heartfelt Sympathies Store.